Tension prevailed at Chittinagar area when the compound wall of a shrine was removed during road widening works in the city on Saturday. 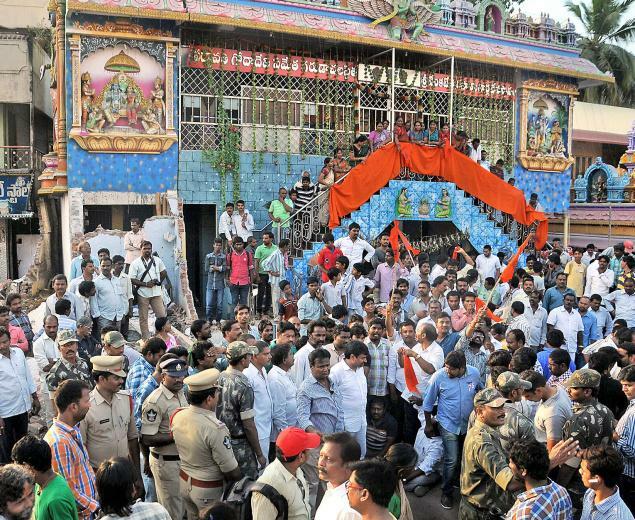 Alleging that the Vijayawada Municipal Corporation officials took up the works and demolished the wall without giving any information to the temple management, the locals led by former MLAs Vellampalli Srinivas and Malladi Vishnu staged a protest. The temple management alleged that the officials insulted the sentiments of a section of people by damaging some idols in the temple during demolition works. Police took a few protestors into custody as a preventive measure. A police picket has been set and the situation is under control, the police said.